The start of the month of May was pretty busy here at The Brothers Brick with the celebration of May 4th (aka Star Wars Day) and some other great announcements. We don’t want you to miss any of the world’s greatest LEGO models, news and building contests, so here’s your weekly Brick Report for the first week of May, 2017. 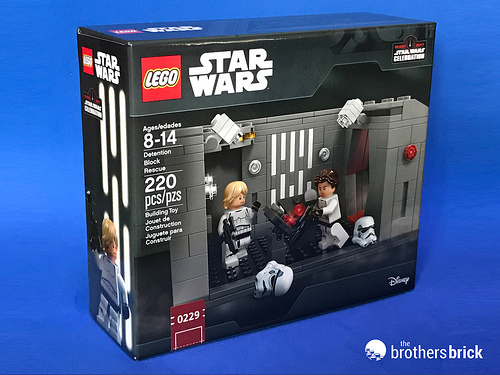 TBB NEWS, REVIEWS & INSTRUCTIONS: This week we are excited to see a new UCS Star Wars set become available in LEGO stores, along with some pleasant deals on sets. Detention Block Rescue (Star Wars Celebration exclusive) [Review] — Our very special review of a limited Star Wars Celebration exclusive, raffled during the official Star Wars convention in Orlando, FL. May the 4th 2017 sales & deals from the LEGO Shop [News] — Star Wars Day was marked with the release of the massive Ultimate Collector Series Snowspeeder 75144, and continued with a free R2-D2 mini-set on orders over $50 from the LEGO Shop. Catch up with the all the latest offers and sales as they are all valid till the end of Sunday, May 7th. Summer 2017 Ragnarök LEGO sets revealed [News] — The first pictures of two LEGO Super Heroes Thor: Ragnarök sets appeared this week online, revealing the all-new designs of our favourite Marvel characters. LEGO Nexo Knights 70349 Ruina’s Lock & Roller [Review] — Take a look at this bizarre Nexo Knights set, which turned our to be a fresh mix of rare colours and impressive minifigures. Registration now open for Brick Fiesta 2017 [News] — The 8th annual Brick Fiesta LEGO convention is ready to welcome its guests in Dallas, TX. Sign up to see some mesmerizing Great Ball Contraptions and many more automated LEGO creations! LEGO typography contest – design a new typeface [News] — Our partner blog New Elementary has announced one of the most unusual building contests of the year so far — a competition of brick-built fonts using some of the recently released round tiles. Ford Mustang Shelby GT500 in Speed Champions scale [Instructions] — This brilliant 6-studs-wide vehicle would be an awesome addition to any LEGO Town diorama. MEKA activated! Build your own LEGO Overwatch D.Va Mech [Instructions] — Our contributor and very talented mech builder Nick Jensen shares instructions to his latest Overwatch mech. OTHER LEGO NEWS: Besides a couple of noticeable pieces of news, this week was pretty uneventful in the LEGO themed part of the web. Cars 3: LEGO does Lightning McQueen and crew in new sets, Yahoo Movies — An exclusive look at the new LEGO Juniors sets available in May. Cassini: The grand finale — No historic event goes unnoticed by LEGO fans, and the conclusion of the Cassini spacecraft mission is no exception. Don’t miss this beautiful brick-built tribute to the seven year journey to the distant world of Saturn and its rings, built by a reader from Chile.